I am interested in applying evolutionary genetic theory and molecular genetic techniques to conservation problems. Genetics can help us investigate issues at the forefront of conservation, such as the understanding the effects of small population size, describing population structure, and predicting disease transmission. These types of data then allow us to contribute to informed management decisions. As part of my postdoctoral research, I employ next generation genome sequencing tools to assess genomic diversity of Wyoming bighorn sheep. These analyses aim to 1) identify genetically interbreeding populations statewide of bighorn sheep in Wyoming; 2) determine translocation genomics (genetic signatures of past translocation events and how those historic translocations contributes to current genetics of each herd); 3) assess gene flow among herds; genetics of migration and dispersal; 4) evaluate herd-specific genetic diversity; 5) estimate genetic effective population sizes for each herd (numbers of individuals contributing to gene pool); 6) test population assignment of specific individual bighorn sheep (for example to identify source population of individual dispersing rams found near domestic sheep); 7) provide genetic determination of sizes of “populations at risk” for epidemiology of disease threats to bighorn sheep in Wyoming (pneumonia pathogens, EHD-Blue tongue, as examples; to estimate disease prevalence, the size of the population at risk is needed as a denominator when number of sick bighorn sheep is the numerator – genetics can help provide this index); 8) develop better tools and reference data sets for use in forensic analysis (for example, poaching cases by the WGFD Forensic lab). These data will form a foundation with which wildlife agencies, including Wyoming Game and Fish Department (WGFD), can monitor the genetic health of Wyoming’s herds into the future. My dissertation research was on the conservation genomics of greenback cutthroat trout in Colorado. I used a combination of targeted sequencing, next generation sequencing, and experimental crosses to characterize inbreeding depression in both the remnant wild and hatchery populations of this rare taxon. I collaborated with the U.S. Fish & Wildlife Service and Colorado Division of Parks & Wildlife to collect tissues and perform crosses. Sequencing genetic material revealed a negative relationship between parental relatedness and offspring fitness. My dissertation also included conceptual and outreach components: I reviewed the taxonomic and cultural barriers to using evolutionary approaches in species restoration and developed a peer-reviewed teaching case study about applying evolutionary concepts to wildlife management in the cutthroat trout system. 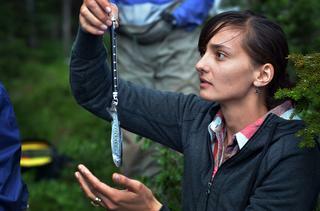 My Master’s research was on the genetic diversity of cutthroat trout at two different scales. At the broad evolutionary scale, I developed a panel of SNPs using a candidate locus approach and combined those markers with published mitochondrial sequences to estimate divergence dates and test biogeographic hypotheses for the colonization of the eastern slope of the Continental Divide. This research was part of a larger study using museum samples to estimate the historic diversity of cutthroat trout prior to major stocking efforts. At the short-term historical scale, I used a combination of mitochondrial sequences and microsatellite markers to describe how stocking practices resulted in a mosaic of cutthroat trout diversity in Rocky Mountain National Park. I used GIS to test for geographical predictors of stocking in RMNP and found that more isolated habitats received fewer fish. My Ph.D. research was on the effects of small population size and isolation of the remnant wild and hatchery populations of the greenback cutthroat trout. I grew up in the mountains west of Boulder, Colorado on a small ranch. When not reading voraciously or playing basketball, I spent my childhood hiking, rafting, and riding horses around the West. I earned a bachelor’s degree in Ecology & Evolutionary Biology and Spanish Language & Literature from the University of Colorado, where I enjoyed making connections between population ecology and the works of conservation writers such as Aldo Leopold and Ed Abbey. After working as a research technician on various ecosystem ecology projects, I returned to the University of Colorado to complete my Master’s degree in Ecology & Evolutionary Biology and continued that research for a Ph.D. Outside of the lab, I enjoy reading trashy sci-fi and fantasy novels and rafting, hunting, and hiking with my husband and two very large dogs.